Each year I make a “themed cake” for Break the Fast. This year, I was so blown away by the incredible invitation we received I decided I had to take homage to Ilayne’s talent. 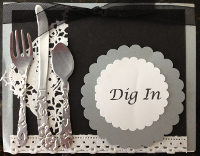 Her invitation used lace for borders and the silverware was punched out of used (and cleaned) soda cans. Absolutely amazing. Roll out white gumpaste to a large thin layer. Cut one piece into a strip 1″ wide and 13″ long and allow to dry flat. Cut another piece into an isosceles triangle 4″ high with an 8″ base and allow to dry flat. (In Euclidean geometry, the isosceles triangle theorem, also known as the pons asinorum, states that the angles opposite the two equal sides of an isosceles triangle are equal. It is, in essence, the content of proposition 5 in Book I of Euclid’s Elements.) When dry, cover the cut, white gumpaste with a lace paper doily and airbrush with black edible airbrush paint. (Use alcohol as the solvent. I use vodka, purchased in the little bottles airlines use. They are inexpensive and do not require much storage space.) The round place mat was cut from the same gumpaste using two round lids as templates. 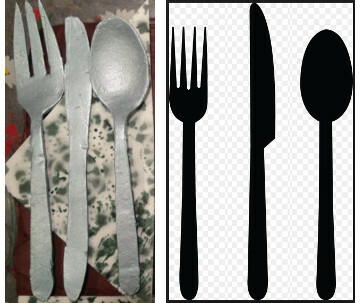 The larger circle was airbrushed silver, the other left white. The words “Dig In” were sugar sheet punch-out letters. I wish I could have done script, but I only had block letters and my piping skills are not adequate to small script lettering. Preheat oven to 325 degrees F (165 degrees C). Grease and flour a 9″ x 13″ pan. Sift the flour and salt together and set aside. Cream butter and sugar until light and fluffy. Add eggs and mix well. Dissolve baking soda in buttermilk. Alternately add flour and buttermilk, beginning and ending with the flour. Pour into the 9″ x 13″ inch pan. Bake at 325 degrees F (165 degrees C) for about 30 minutes, or until toothpick inserted into cake comes out clean. Cool cake completely before icing. Each finished cake should be 1″ to 1.5″ high, slightly dense and very moist. Melt chocolate and butter in the microwave, or in the top of a double boiler. In a large bowl, combine confectioners’ sugar, vanilla and 1/2 of the milk. Blend in the melted chocolate mixture. Add remaining milk, a little at a time, until desired consistency is achieved.